When I sing songs like this, or ‘Idumea’, it is purely for the power and beauty of the tune, and the words as poetry; not because I have a belief in any kind of life hereafter. However, at the end of a week in which we buried my mother, this seems an appropriate song to post. I first heard it sung by Cathy Lesurf, with the Oyster (Ceilidh) Band in the early 1980s. Subsequently I’ve heard powerful recordings by singers including Emmylou Harris, Natalie Merchant and Norma Waterson. But the version which really made me want to learn the song was the one which Alan Lomax and Shirley Collins recorded in October 1959 from the Arkansas singer Almeda Riddle. Their recording was included on the CD Southern Journey Volume 4: Brethren, We Meet Again – Southern White Spirituals. I then found the words and audio for a fuller four-verse version, recorded from Almeda a few months earlier in August in 1959 by John Quincy Wolf, Jr., on the website of the John Quincy Wolf Folklore Collection. Almeda Riddle at her home, 1959, photographed by Alan Lomax. All the versions I had heard previously were resolutely in the minor key. One thing I like about Granny Riddle’s version is that it is essentially in the major key, but with plenty of flattened and – better still – ambiguous notes. These tonal ambiguities are very much a part of the singer’s vocal style, and the power of the performance overall, but I have found it difficult to reproduce them without it sounding like I’m trying to do an impression of an Arkansas grandmother. So I’ve tried to sing the song in a way that captures the spirit of Almeda Riddle’s version, while staying true to the way I normally sing. Not sure how successful I’ve been in this, but it’s too good a song not to sing. Incidentally, I recently stumbled across this fine solo performance of the song by Bill Monroe which, it strikes me, is in very much the same vein as Almeda Riddle’s. And here’s one of several Sacred Harp performances you can find on the web. The history of the song is covered on this Mudcat thread: http://www.mudcat.org/thread.cfm?threadid=23495 . It seems that the words at least date back to the mid-nineteenth century. Valentine’s Day is over… but here’s a sentimental love song which would have been perfect had I been organised enough to get it posted yesterday. I learned this song over thirty years ago from Charlie Bridger of Stone-in-Oxney in Kent. Around the same time Pete Coe was singing the song around the clubs, in a version learned from the Old Time singer and banjo-player Uncle Dave Macon. The song was in fact very popular in America. When published by New York publishers Thomas B. Harms & Company in 1881 it became the company’s first big hit. In an 1884 newspaper interview, in response to the question “What was the most successful song ever written during your existence?” the publisher’s reply was “Oh, Wait Till the Clouds Roll By had by far the greatest sale. We sold over 75,000 copies in a single month. It was the easy, jingly music did it, and the sentimental words”. The published version states “words by J T Wood, music by H J Fulmer” and for many years I took this at face value. Indeed, in my Musical Traditions review of The Anglo-German Concertina: A Social History I took the author Dan Worrall to task for stating that the song had been written by an Irish singer and concertina player called Tom Maguire. In fact it turned out that Dan had done his research and I hadn’t, and he has put together all the information he has on Tom Maguire in a short paper on his website: Tom Maguire, a forgotten late nineteenth century Irish vocalist, comedian, concertinist, and songwriter. Much of the information in this post comes from that source – thanks Dan. “J T Wood” and “H J Fulmer” were actually fictitious pseudonyms of the American musical arranger Charles Pratt. He used the same pseudonyms to claim authorship for ‘My Bonnie Lies Over the Ocean’, which of course was – at the very least – not an entirely original composition (check out the wonderful minor key version sung by Cecilia Costello on the recent Musical Traditions CD Old Fashioned Songs). When facing prosecution for “creating an obstruction” outside a London Theatre in 1907, Tom Maguire claimed authorship of this and other songs under oath. Whether Pratt had bought the publishing rights from Maguire, or simply stolen the song, is not known. Either way, by the early twentieth century poor Tom Maguire, now blind and nearly deaf, was destitute and reduced to singing and playing his concertina on the streets, and hawking books containing words of the songs he had written earlier in life. I’m not sure whether Charlie Bridger learned the song orally or from a printed source. Either is equally likely – he had a large store of song books, News Chronicle Song Book and the like. 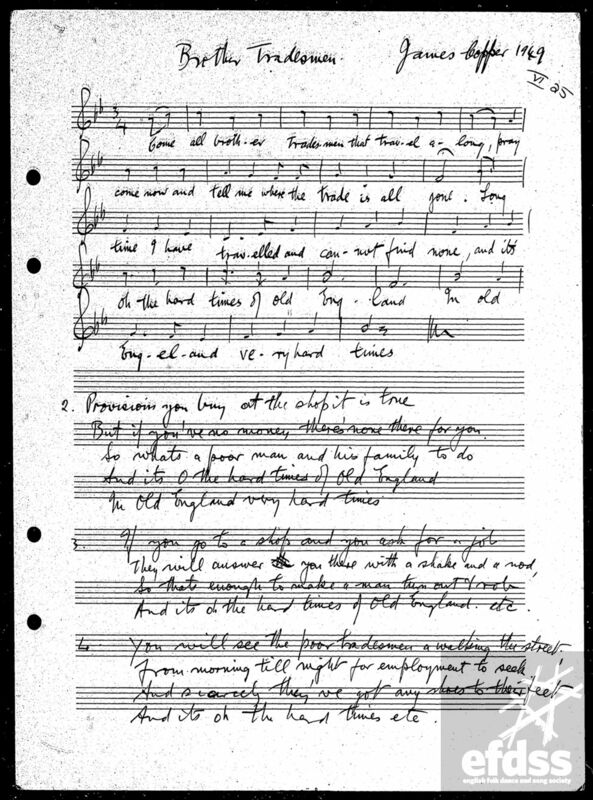 Given that he was born in 1913, he’s not likely to have learned it from an individual ballad sheet, but ‘Wait till the clouds roll by’ featured on a number of such sheets – see the Full English and the Bodleian’s Broadside Ballads Online. Wait till the clouds roll by, published by H.J. Wehman, New York, 1881. From Broadside Ballads Online. The song also inspired a reply-song, and a number of parodies, for instance Put Me Some Jam-Roll By, Jenny. Little Thomas’s New Banjo Song (Mohawk Minstrels). Popular Parody on “Wait Till the Clouds Roll By” and Wait till the clouds roll by, Billy! (in support of William Gladstone’s stance on Home Rule). As well as being a singer, Charlie Bridger was a keen brass and wind band player. He played tenor horn in Woodchurch and Cranbrook bands, and also played clarinet. When I first recorded him in April 1983 he played me one tune on clarinet, a version of the ‘Jenny Lind Polka’ with an extra part tacked on the end. I’ve been playing that version of the tune almost as long as I’ve been singing the song. A few years ago, having decided to put the tune and song together, I was delighted to find that, slowed down, the last two bars of ‘Jenny Lind’ were pretty much identical to the last two bars of the song – clearly they were destined to be played together. 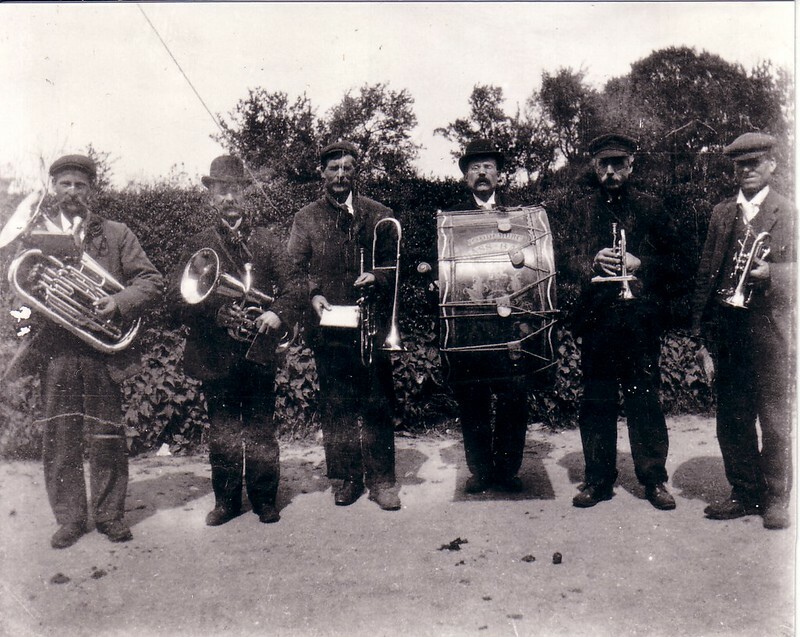 Woodchurch Band, late nineteenth century. From a copy of the photo provided to me by Charlie Bridger. His father (Charles) and grandfather (Tom) are both in this photo. Another song from the Copper Family repertoire, and one which seems never to have been collected elsewhere. This is included on the recent Fellside release Bob and Ron Copper: Traditional Songs from Rottingdean, a CD reissue of a limited edition EFDSS LP which featured recordings made by Peter Kennedy, and which first came out in 1962. Unusually – given that one tends to think of Bob Copper as the “lead singer” in the family from the 1960s onwards – there are no solos by Bob on this album, but three by his cousin Ron, including ‘Hard Times of Old England’ (in contrast, there are no solos by Ron on the 1971 box set A Song for Every Season). Listening to that recording made me realise that, while I might soon have moved on from the Mike Batt-produced Steeleye Span arrangement of the song (it’s on their All Around My Hat LP, and features an arrangement which is very much in the same mould as the title track), the way I sing the song betrays the fact that I originally learned the song from Steeleye, and not from Ron Copper. Brother Tradesmen. noted from Jim Copper, by Francis Collinson,1949. From the Full English Archive.